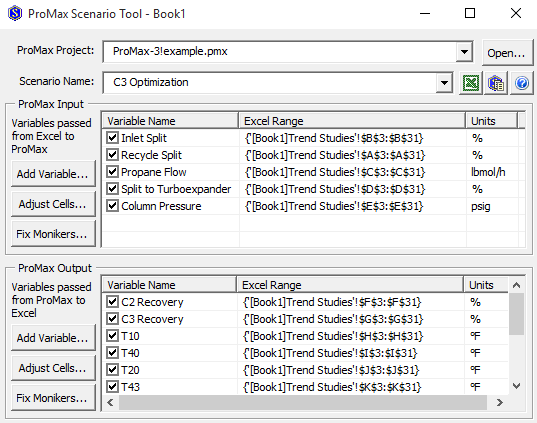 The Scenario Tool is an Excel add-in that can be used in either an Excel workbook embedded within a ProMax simulation or in a separate external Excel workbook. The Scenario Tool is found in the ProMax ribbon within Excel. Within Excel you create a table of inputs you wish to adjust in your study along with any ProMax outputs you would like to have reported back. 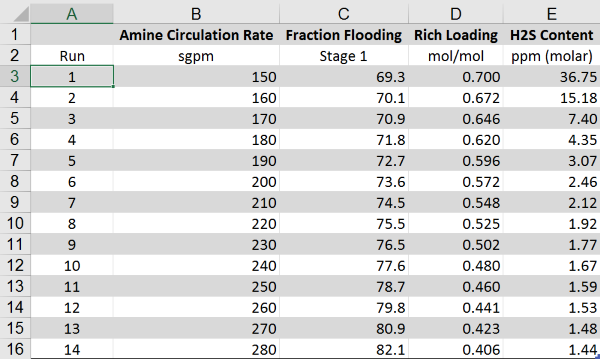 A simple example of this would be to run studies on an amine unit where the amine circulation rate is varied and key data such as sweet gas H2S content, rich loading, and column flooding are reported and analyzed. The scenario tool can be utilized in much more complex situations as well. As a user you have the freedom to select as many inputs and outputs as you desire. For example, using the Scenario Tool you could optimize C3 recovery in a cryo plant by varying the gas split to the reboiler, refrigerant flow, the split to the turboexpander, the column pressure, etc. The scenario tool also provides you with a variety of formatting capabilities to make the results easy to use and interpret. These capabilities include creating Excel graphs to show data trends, auto-saving each run as its own ProMax file, and creating 2-dimensional data tables such as steam tables. You can even have the scenario tool create a PDF report for each case, such as emissions reports for different well compositions and flow rates. The possibilities are endless! For information on how to use the Scenario Tool, watch our “Scenario Tool Basics” web tutorial here. How to embed an Excel workbook into a ProMax simulation. How to add the Scenario Tool to the Excel Ribbon bar. How to choose inputs and outputs within the Scenario Tool.